It’s as clear as can be and originally stood in Le Corbusier’s living room: the “LC5” sofa. In 1934, Le Corbusier designed it what was for him unusually expansive sofa together with Pierre Jeanneret and Charlotte Perriand for his apartment in Paris’ Rue Nungesser et Coli 24, a first-floor flat that he moved into with his wife Yvonne and divided into a studio and a private apartment. 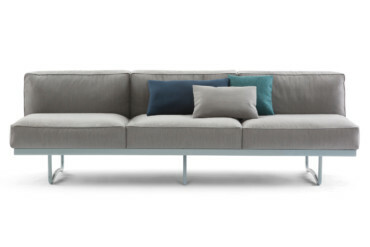 That said, the “LC5” Cassina is now bringing out as part of its “I Maestri Collection” is not entirely new. Back in 1974 there was a Cassina re-edition, but only in one side and exclusively with a chromed frame. Now, the archives of Corbusier and his colleagues have been scanned and the original from his Parisian apartment consulted – to re-launch the sofa in two sizes and with a different finish.